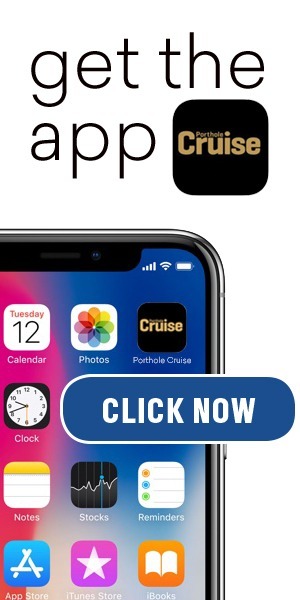 Most cruise passengers whose ships call at Cadiz, a White City in the Costa de la Luz (the Coast of Light) in the Andalusia region of Spain, immediately head out of town. It’s understandable, as the nearby treasures of Seville and the wines of Jerez de la Frontera beckon – I myself visited Seville twice and Jerez de la Frontera once before I decided to give Cadiz a look. 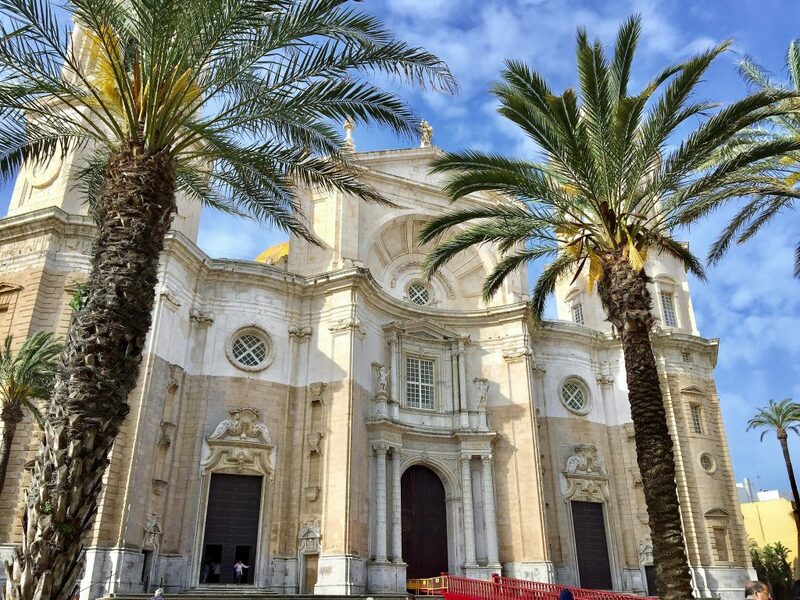 I found that Cadiz, Spain, founded 3,000 years ago by the Phoenicias (the Phoenicians called it Gades and later the Romans called it Gadir), has much to offer travelers including excellent examples of Spanish architecture from other eras, good beaches and delicious regional cuisine. 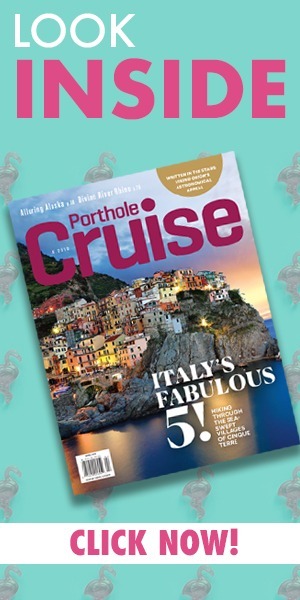 (1) The city’s Roman Catholic Cathedral with an impressive dome that can be seen from ships’ outer decks as vessels approach the port. Baroque and Neoclassical in style with an egg-yolk-like dome and yellow tiles, the Cathedral houses in its crypt the tomb of distinguished Cadiz-born composer Manuel de Falla (who gave the world the “Ritual Fire Dance” among many other compositions). A small fee is charged to tour the Cathedral. Nearby are the partly excavated ruins of a Roman theater that dates from circa 70 B.C. and the “old cathedral” or Santa Cruz Church (consecrated as the city’s cathedral in 1263, and now a Roman Catholic Church). 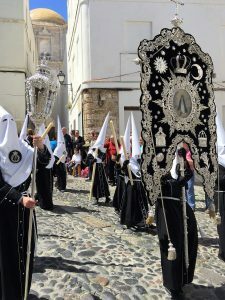 On one of our visits to Cadiz during Holy Week, religious processions with bands and floats that rival the better-known ones of Seville, left from the Santa Cruz Church and wound their way to the Cathedral (processions may also take other routes). Holy Week is April 14-20 in 2019. 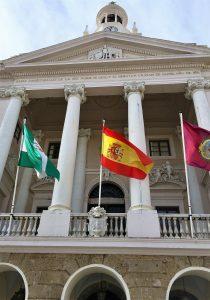 (2) Cadiz City Hall. A beautiful Neo-classical building that dates from the 18th century, it has a façade that rises over a polished brick portico supported by semicircular arches. It has a balcony with beautiful Ionic columns crowned by a triangular pediment with a relief of Hercules, the mythical founder of the city. The interior of the building has a square courtyard with a white marble statue of Hercules in one of the bays – the statue used to adorn a fountain before it was moved to the courtyard of the City Hall. The City Hall is open to the public on Saturdays from 11 a.m. to 1 p.m. provided no events are taking place, but we went on a different day and asked a security guard at the entrance about the Hercules statue and he beamed and took us right in to see it. Admission is free. (3) The Central Market. This is a huge covered place in the Plaza de la Libertad. It has all manner of meats, fish, fruits and local produce – a great place to look around and learn about what people eat in Cadiz and if you wish, also have your lunch there, perhaps sampling such goodies as fried baby shrimps sold in paper cones. Also, in the food and goodies department, give your taste buds a treat by trying some local delights in the city’s markets, restaurants and cafes, particularly langoustines and other fresh seafood, Iberian ham, wines from Jerez, turrón (a kind of nougat) and chocolate con churros, cocoa with fried pastries. 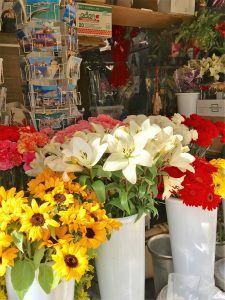 Nearby the Central Market is the Plaza de las Flores with vendors selling lovely flowers, so why not pick up a fresh, fragrant bouquet to adorn your cabin? (4) Beaches like La Victoria, Santa Maria, La Cortadura and La Caleta (the latter, in the old town, is framed by the Santa Catalina and San Sebastian Castles). The water temperature is a tad too cool for a Floridian like me – averages 73 degrees in July – but the sun and the scenery can’t be beat, no matter where you come from. (5) The Tavira Tower is a good place for panoramic views of Cadiz. This attraction has exhibits that tell the story of the city, which in its heyday was a key Spanish port of trade with the West Indies in the 18th century; an observation deck, and a camera obscura, which projects real-time images of what is happening outside the tower on a horizontal screen in a room with black walls. Admission is 6 euros. (6) The Doñana National Park. This is a natural reserve and UNESCO World Heritage Site, with shallow streams, sand dunes and marshes ideal for bird watching.